Once on a mountaineering trek with friends into the wild and wonderful Bens of breathtaking Connemara, we came upon an old broken-down wall and in a hole in this wall was a worn-out hobnailed boot. 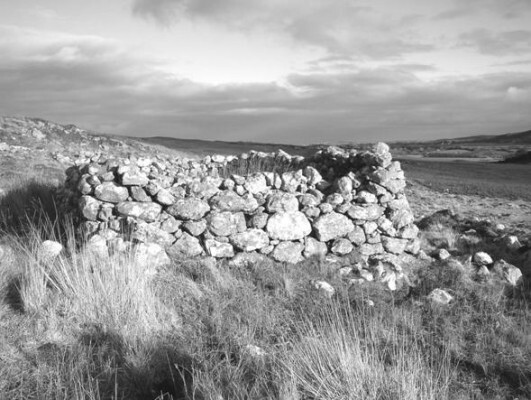 Then, on the offside of the wall lay the remains of an ancient dwelling called a Bothán. Having briefly examined both of them, we felt each had an interesting story to tell, so we sat on a weathered quartz rock to contemplate both. 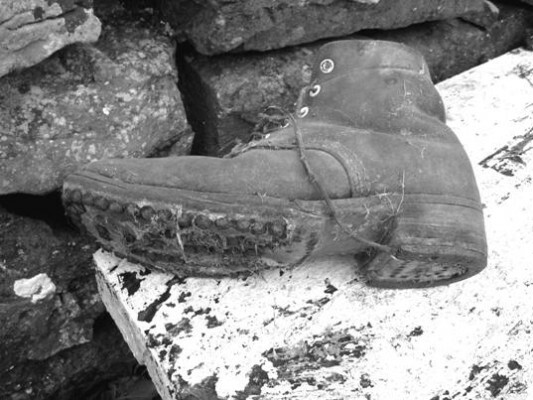 Hobnailed boots were made by Irish craftsmen –– bootmakers called ‘Greasai Bróg’ in Irish. These boots were made to order and would last a lifetime. The very thick soles are almost completely covered with hobnails and the stout heels are protected by an almost horseshoe-shaped iron tip. A big change from walking barefoot to wearing hobs! And now to the Bothán. Its history is shrouded in the mists of time. The first tribes to inhabit Ireland were hunter-gatherers who probably lived in caves. The next were called our first farmers. They would have built primitive dwellings, like wicker-type houses, thatched by any of the several natural materials. So it was, in the period before Christ and indeed probably into AD times as well. Then we take a huge leap into the 17th to 19th centuries and pre-famine times when the Botháns were built of stones such as were available scattered around. You see, when Ireland had a population of some 8 million, and all the arable lands were owned by the landlords, who employed and housed their few workers, the rest had to take to the un-arable lands or to the mountains sides to try and eke out a living by sowing spuds and maybe keeping a cow for fresh milk, with the overs churned for butter and that lovely buttermilk. Some managed to keep a pig for slaughter. Most of the children went to hedge schools then to learn Irish, which was forbidden in those days. The Botháns in which they lived would have no chimney. The fire was in the middle of the floor and the family sat around it on the floor. There was one small window, which was taxed! The roof was of tree branches, not sawn rafters, and thatched with sedge. There is a cluster of such Both á ns in Leitir Craff, and you can see on the right from the entrance to the mines the traces of ridges, now overgrown with heather, where the spuds were sown. In fact, if you travel almost anywhere through Connemara as the sun is going down the slanting rays pick up traces of these potato ridges where forestry is absent. Those were tough times in Connemara, no doubt.